The highly anticipated third Avengers film is a spectacle on the scale of no other superhero flick. During its lengthy two hour and 30 minute runtime, the film brings the audience on a hilarious and emotional journey spanning countries and planets, featuring awe-inspiring action set-pieces, jaw-dropping twists and a laundry list of superheroes finally assembling on the big screen. 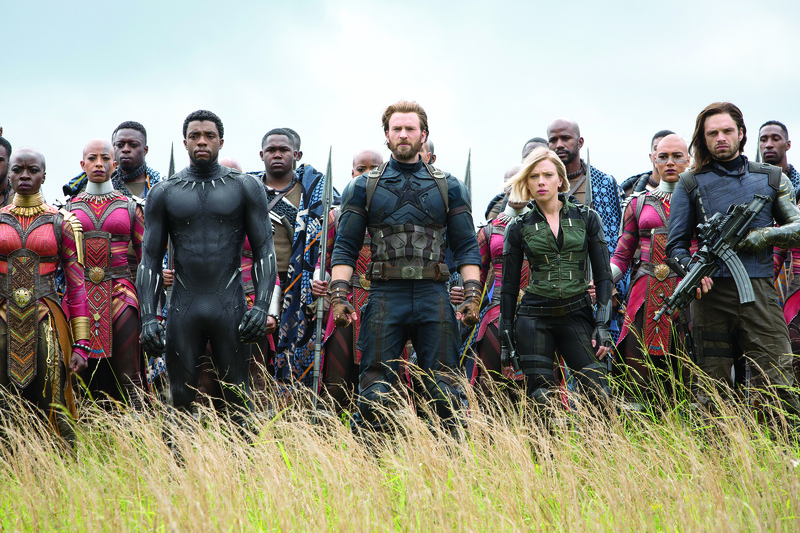 While not a perfect superhero film, its exciting character mashups, ambitious plotline and shrewd use of humor establish “Avengers: Infinity War” as one of Marvel’s best. The large-chinned, giant purple villain Thanos (Josh Brolin) first haunted the Marvel Cinematic Universe (MCU) in the post-credits scene of 2012’s “The Avengers.” Six years later, he has finally arrived on Earth, intent on obtaining all six “Infinity Stones,” powerful gems that expand his powers. Standing in his way are the Avengers, who must overcome their differences from “Captain America: Civil War” and assemble. They acquire help from Star-Lord (Chris Pratt) and the Guardians of the Galaxy, as well as Black Panther (Chadwick Boseman) and the citizens of Wakanda to stop Thanos and his henchmen before he fills his gauntlet with Infinity Stones and wipes out half of the world’s population. For a character whom Marvel films have teased for so long, Thanos, for the most part, delivers. Fans never doubted that he would be an evil foe for the Avengers to face, but directors Joe and Anthony Russo give him more layers than the prototypical movie villain. The film dissects his relationship with his daughter Gamora (Zoe Saldana) and manages to rationalize his wicked plan. Along with this, he is intimidating — he fights our heroes punch for punch while inflicting real, visible damage. He pushes the Avengers to their limits and uses the Infinity Gauntlet in creative ways. On the other hand, Thanos’ henchmen aren’t as effective. They serve merely as his CGI slaves, with unclear powers and boring personalities. The cast list of “Infinity War” is sprawling, but the Russo brothers do a commendable job of giving everyone their due. The beloved Guardians — particularly Star-Lord and Gamora — smartly receive a significant amount of screen time. Their natural banter and interactions with Thor (Chris Hemsworth), Tony Stark (Robert Downey Jr.) and Spider-Man (Tom Holland) are a riot, with the characters playing off each others’ superpowers and quirks. Scarlet Witch (Elizabeth Olsen) is finally given a compelling storyline — an Infinity Stone rests within the forehead of her lover, Vision (Paul Bettany). While their relationship wasn’t fleshed out in previous films, “Infinity War” makes their love story natural and their conflict captivating. On the other hand, Thor’s side-quest to find a new weapon to replace his smashed hammer isn’t quite as effective. He brings along the always-amusing Rocket Raccoon (voiced by Bradley Cooper) and Groot (voiced by Vin Diesel), but the audience wonders why we are investing so much time into Thor’s weapon when we should be focused on the conflict with Thanos. Naturally, due to time constraints, not every character has much to do. The Winter Soldier (Sebastian Stan), who was notably included in the post-credits scene of “Black Panther,” only serves as a soldier in the Wakandan army, and the Wakandans themselves, especially Shuri (Letitia Wright) and M’Baku (Winston Duke), have minor roles. Even Captain America (Chris Evans) lacks a character arc, although he features prominently in the film’s climactic battle scene. I would be remiss not to mention the film’s action sequences, which come fast and furious at the audience. From the opening scene, the film is thrillingly action-packed, offering little room to breathe. This makes the seemingly long runtime pass rapidly, and keeps the audience on the edge of their seats. The Russo brothers take advantage of and connect their characters’ various special abilities in battle. Whether it’s Star-Lord leaping across Doctor Strange’s (Benedict Cumberbatch) magical shields to shoot an enemy or Rocket Raccoon machine-gunning baddies on the arm of the Winter Soldier, this merge of powers elevates the fight scenes past the good guys using their powers to fight the bad ones. Unlike recent Marvel films like “Guardians of the Galaxy: Vol. 2” and “Thor: Ragnarok,” “Infinity War” does a remarkable job of balancing humor with emotion. The film brims with zingers and one-liners, almost all of which spur giggles, but the jokes never discount the drama taking place. The film never laughs off the high-stakes threat that faces our heroes, but instead heightens the threat with wisecracks. And, when the movie turns dark and tense, it doesn’t throw in jokes to skew the tone. As someone who has been critical of the MCU’s latest offerings such as “Guardians Vol. 2” and “Ragnarok,” I can confidently say that “Avengers: Infinity War” is one of the best Marvel films in recent history. Its dazzling action scenes, shocking revelations and brilliant use of humor make it a worthy and memorable theatrical experience that will leave you stunned and anxious for more Avengers action. Hopefully the currently untitled “Avengers 4,” set for release on May 3, 2019, will provide just that.